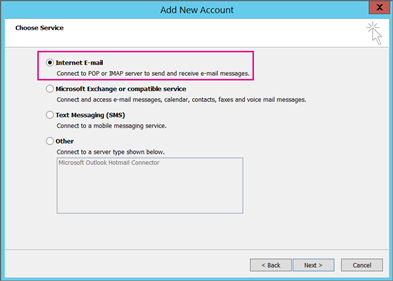 Following are the main problems customers encounter when they import a .pst file to Outlook. If you have a different problem, or if these solutions don't work for you, please contact us! Error message: "You do not have permission to access the file"
If you saved the .pst file to a CD-ROM you'll get this message. Copy the .pst file to your computer, a USB flash drive, or other location. Then right-click the .pst file, choose Properties, and click to clear the Read Only check box. Now try to import the .pst file. See this kb article for more info. This type of error can also happen if you switched from logging on to your computer with a local account to a Microsoft account while the .pst file was in use. To fix: right-click the .pst file, choose Properties > Security > Edit > choose your Microsoft account, and choose Full control. Now restart Outlook. Error message: "The source and destination folders for this operation cannot be the same"
To solve this problem, rerun the import process. When you get to the following dialog box, choose Import items into the current folder. Error message: "Could not complete operation because the service provider does not support it"
First, remove your email account from Outlook on your desktop. For example, if you have more than one account in Outlook 2010, you can right-click your selected account and choose Remove to remove it from Outlook. 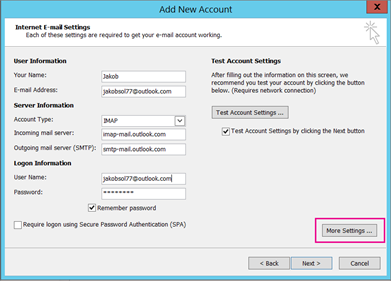 If it's the only account currently in Outlook, choose File > Account Settings > Account Settings > Remove. 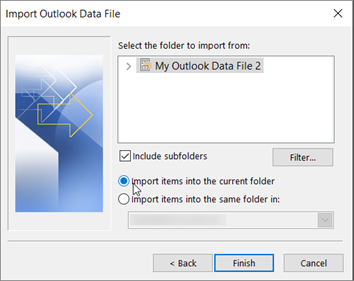 At the top of Outlook on your desktop, choose File. Type a name for your account (example: Jakob), the email address (example: jakob77@outlook.com), and password you use to sign in to your email account on the web site. 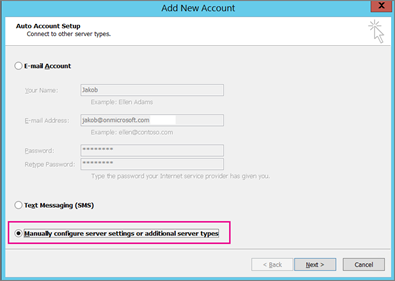 Choose Manually configure server settings or additional service types. Choose Next. User Name: youralias@outlook.com (or whatever your email address is). 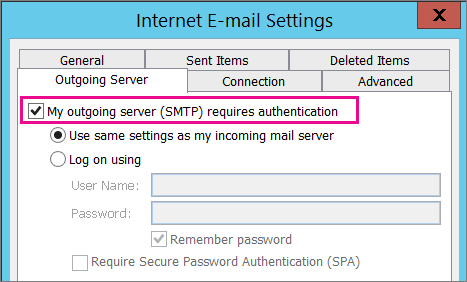 Password: type the password you use to sign in to your email, for example, on the Outlook.com web site. If you have Two-Step Authentication enabled, get an App Password. Select the Outgoing Server tab, and choose My outgoing server requires authentication. Choose Next to test your settings. Note: the most common reason for the connection not working is a typo in the email or password. Unfortunately Outlook doesn't tell you that's the problem but gives you an uncomprehensible error message. If the connection doesn't work, double-check everything for typos. 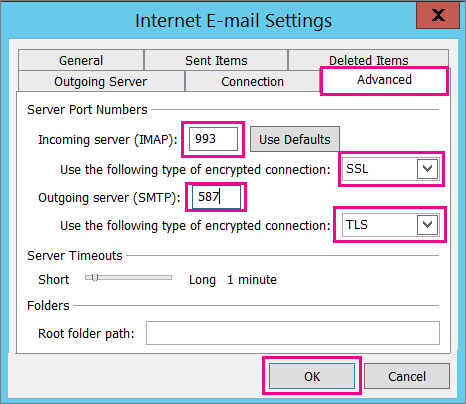 Now you should be ready to import your .pst file into the email account. My emails were imported but not my contacts or calendar items. How do I fix this? The most likely cause is that the contacts and calendar weren't exported to the .pst file. 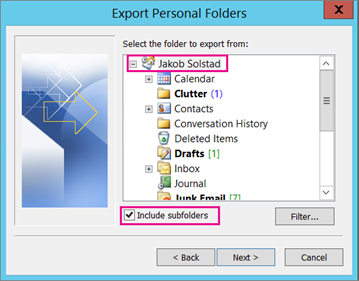 Try exporting your info to another .pst file. When you get to the following dialog box, make sure Include subfolders is checked. That way contacts and calendar are exported too. I restored my contacts from the backup .pst. Are the restored contacts in the Outlook .ost file or the re-dated .pst file? I think your restored contacts are in both places: your offline cache (.ost) and your re-dated .pst file. When you imported your contacts from the back up .pst file, a copy of your contacts was made, and they were deposited in the appropriate contacts file. You can delete or rename the backup .pst file if you want. How do I get my old Outlook subfolders back? The most likely cause is that the contacts and calendar weren't exported to the .pst file. Try exporting your info to another .pst file. When you get to the following dialog box, make sure Include subfolders is checked. That way subfolders are exported too.